Have you ever dreamt of owning a coffee shop? Aside from being a musician, a photographer, a journalist, owning a coffee shop has been one of my dreams in my adult life. The warm cozy decor, the earthy aroma of coffee, the sweet treats, the chit chatting with customers, there is just something irresistible about a nice family run coffee shop in your neighborhood. This afternoon, after the baking in the morning, I made myself a nice cup of coffee, sitting on the patio, served with these delectable chocolate biscotti, watching Yogi, our dog, running around in the yard, I let my dream took over me again. After quitting my job for over ten years in the corporate world, what is my next step? Is there a possibility to realize my dream? 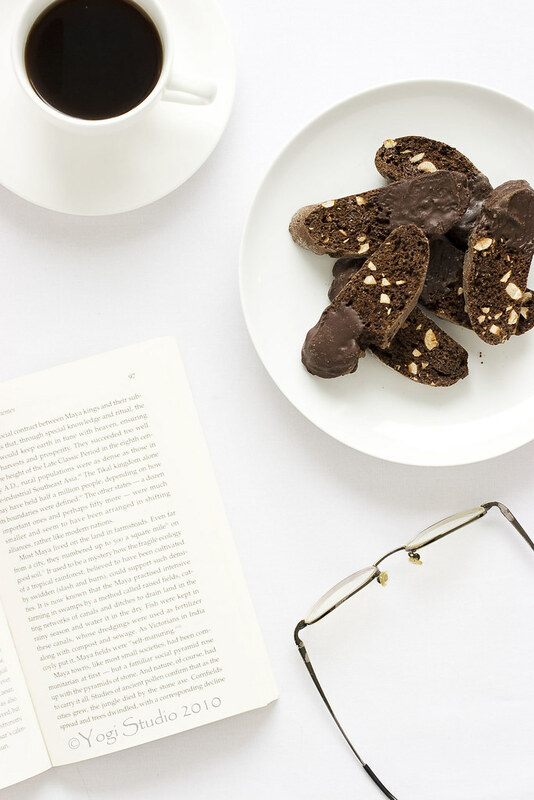 If I have a coffee shop, these biscotti will definitely be on the menu. The chocolate coatings make them a special treats. But it is still delicious even without the coatings. They are easy to make. All you have to do is to mix the wet ingredients and then dump the dry ingredients into the wet ones and mix them together. Then you have to wait for them to bake twice under low temperature. It is always tempted to try a few pieces after the first bake is done. The most difficult part of the recipe is to peel the hazelnuts. Please see my kitchen notes below . Preheat oven to 300ºF. Line a large baking sheet with parchment paper/wax paper/silpat. In a food processor fitted with the metal blade, combine the chocolate and brown sugar and process until the chocolate is very fine; set aside. Sift together the flour, cocoa, expresso powder, baking soda and salt into a bowl; set aside. Add eggs, vanilla extract and almond extract in the workbowl of an electric mixer. Beat the egg mixture on medium speed until blend. Add sugar, beat until blend. Reduce speed to low, add flour mixture, mix until a stiff dough forms, adding the hazelnuts when the dough is about half mixed. On a floured surface, divide the dough in half. Form each half into a log 12 inches long. Transfer the logs to the prepared baking sheet, spacing them well apart, and pat to even the shapes. Bake until almost firm to the touch, about 50 minutes (logs will spread during baking). Remove from the oven and let cool for 10 minutes. Leave the oven set at 300ºF. Turn the slices over and bake until crisp and dry, about 25 minutes more. Turn off the oven and let the biscotti cool completely in the oven with the door slightly ajar. Combine the chocolate and shortening in a microwave safe bowl. Microwave at 80% power for 30 sec. Take out and stir with a wooden spoon. Microwave for another 30 sec at 80% power. Take out and stir. Depend on the power of your microwave oven, if large chunks of chocolate remains, you can keep melting the chocolate at 50% to 80% power for 10-15sec for 2 to 3 times more. But each time, give it a good stir and let the heat retained in the mixture to do the job of melting first before putting in the microwave again. For 4 oz chocolate, it takes me about three 15sec rounds in the microwave and enough heat is retained in the mixture to melt all the chocolate completely. Be careful, do not over heat the chocolate. Holding one tip of the cooled cookie, using a wooden spoon to coat another tip end of the cookie with the hot chocolate. Let it set on a cooling rack on top of a baking sheet. Refrigerate until set. Store in an airtight container in the refrigerator for up to 2 weeks. How to peel hazelnuts? To peel the hazelnuts, toast them at 350ºF for 10 to 12 mins. Wrap them in a tea towel and wait for the hazelnuts to cool down. Then, you can either rub the hazelnuts with the tea towel or rub them between your palms. You should work closely to a sink so that you can blow away the skin easily. This is not a perfect way. Some skins may still attached to the nuts but they do not affect the taste and texture of the cookies at all. There is another way to peel them by blanching the nuts with baking soda before toasting. I have not tested that before. If you have tried that or if you have other better ways, please let me know. The dough is quite sticky. Use a wooden spoon instead of a spatula to scrape the dough out from the mixing bowl to the work surface. The work surface and your hands have to be heavily floured (but don't be excessive) in order to work the dough easily. The original recipe uses 8 oz of chocolate for the coatings and applies the coatings to one side of the cookie instead of the tip end of both sides. It is your preference to decide how much coating and where you want it to apply. These are the more crispy and crunchy biscotti made without butter. Therefore, be forewarned that they are quite hard in texture. You can slide it thinner to do the second bake. 1/2" is a good thickness. Can i ask you - what kind of camera you use? And does you use screen-photo box or something to get so crispy white pix? Thank you. Your blog is beautiful too. I'm using Canon EOS 20D and I don't have any lighting equipment or softbox. All my shots were done in natural light, very close to the patio door. I adjusted the exposure compensation and took a million shots until I got it right! I'm still learning how to translate what I visualize in my mind to the actual pix. But this is so much fun! 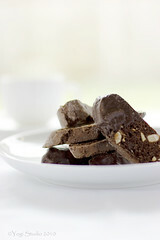 I love this biscotti - your recipe's almost the same as mine. I don't bother peeling the hazelnuts - the skin gets lost in all the chocolate. I may try leaving them on next time. I have been baking biscotti for YEARS. And so I got a baking tip. Once you cut the biscotti and go for the SECOND bake, lay the cookies cut side down on a cooling rack set on top of the cookie sheet. No need to flip thru the second baking process! The biscotti come out superb! I know as I include biscotti in every order I ship to my customers. I'll be trying your recipe. I've never had much success with biscotti. They always turn out as hard and dense as a rock and not even dunking them in coffee can redeem them. But your's sure look amazing. Oh my, that looks absolutely delicious! Can't wait to try them! I've found an easier way to peel the hazelnuts, boil water in a pan, when the water is boiling add a tbsp of baking soda, when the baking soda is dissolved add the hazelnuts and boil for about 3 minutes. The peels slide off! When you're not sure whether you've boiled them long enough, take one out, rinse with cold water and the peel should come off. If the peel came off, rinse all the hazelnuts with cold water;) After that you can roast them in a non-stick frying pan.